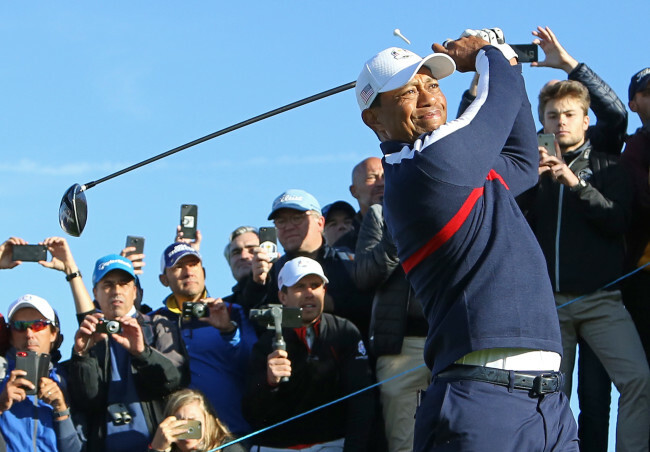 SAINT-QUENTIN-EN-YVELINES, France -- Tiger Woods paused on his walk toward the 18th green at Le Golf National and threw his head back in laughter. These are happy times for Woods, regardless of whatever Bryson DeChambeau said to cause such a reaction Tuesday. Now if he can get that to translate in the Ryder Cup. For all his amazing feats in golf -- 80 victories on the PGA Tour, the most recent on Sunday at the Tour Championship after returning following a fourth back surgery that threatened to end his career -- Woods has been on only one winning team at the Ryder Cup. That was nearly 20 years ago and required a record comeback on the final day. His own record is 13-17-3, a product of being on six losing teams. Woods used to get defensive about his mark, pointing out that no one could recite the Ryder Cup record of Jack Nicklaus (17-8-3 during an era of US dominance), but that everyone knew Nicklaus had won 18 majors. One element he faced every two years was trying to be on a team of 12 players even as the golfing world saw it as Tiger Woods and 11 other Americans. He was 21 when he played his first Ryder Cup in 1997 and already was the sport’s biggest star. Back in the Ryder Cup as a player for the first time in six years, Woods is in the spotlight again. One year ago, he was riding in a cart as a vice captain in the Presidents Cup, having played one PGA Tour event in two years with no certainty there would be another. And then he made yesterday look like yesteryear with a wire-to-wire win at the Tour Championship, his first trophy in more than five years and the feeling that more was to come. Woods still hasn’t grasped the significance of the victory at East Lake. He didn’t know the TV ratings because he headed straight to France on the charter flight, had a team dinner and then was out in the chill of Tuesday morning for his first look at Le Golf National. NBC Sports Group said the final round was the highest-rated Tour Championship on record dating to 1991. Woods and DeChambeau, one of three Ryder Cup rookies on the US team, have been looked upon as a potential partnership for Le Golf National. Furyk said not to read anything into the way he sent off his players in groups of four for the first official practice round. He said Tuesday was more about learning the golf course because only six US players have seen it. Phil Mickelson, who also has a losing record (18-20-7), joined Woods, DeChambeau and Patrick Reed. Mickelson then caused a small stir by saying he and Woods would welcome another chance to play together, even though their 2004 partnership at Oakland Hills resulted in two losses and plenty of ridicule in the years that followed. “I do have an idea of what Captain Furyk is thinking, yeah,” Mickelson said with a grin, allowing for no other detail. The best personal mark Woods ever had at the Ryder Cup was the only other time he was a captain’s pick, going 3-1 in Wales. He failed to win a match in his most recent Ryder Cup, going 0-3-1 at Medinah when Europe rallied to win on the last day. Woods, however, is more than six years removed from the Ryder Cup. He has gone through four surgeries that kept him out of 10 majors and two Ryder Cups, though he comes to France with a winning feeling -- not just the Tour Championship, but his role as a vice captain at Hazeltine two years ago during a rare American victory.